This is a list of the best Ganesh Idols and Ganpati Mandals in Mumbai in 2015 (source “Times Utsav Moorti Sanman”). 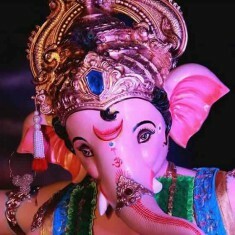 1st PRIZE: BEST GANESH IDOL IN MUMBAI “Chinchpokli Cha Chintamani” (Chinchpokli Sarvajanik Utsav Mandal) GSB Seva Mandal, King’s Circle Khetwadicha Ganraj (Khetwadi 12th Lane) Khetwadi 12th Lane, Girgaum. Idol designed by Raju Shinde. 2nd PRIZE: BEST GANPATI MANDAL IN MUMBAI Sahyadri Krida Mandal, Chembur Mumbai Ganesh Mahotsav by Lodha Foundation, Grant Road Fort Vibhag SGM (Fort Icchapurti) – Mysore Palace Mumbai Ganesh Mahotsav by Lodha Foundation, Grant Road. Art director Nitin Desai. 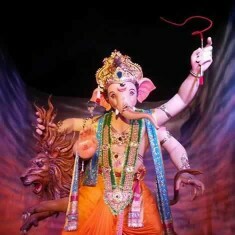 3rd PRIZE: BEST GANPATI MANDAL IN MUMBAI “Andheri Cha Raja” (Azad Nagar Sarvajanik Ganesh Utsav Mandal, Andheri West) Shiv Chhaya Mitra Mandal, Turbhe Sarvajanik Ganeshotsav Mandal ( Vashi Sector 17) Khetwadi 12th Lane, Girgaum. Mandal based on ISKCON temple. Art director Dilip Dada. 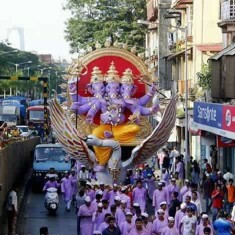 The Khetwadi Lane 11 Ganpati is popularly known as “Mumbaicha Maharaja”. 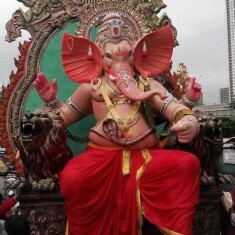 The 2015 “Mumbai Cha Maharaja” Ganpati is made by the famous Ganesh sculptor, Vijay Khatu. The shape of Khetwadi Gali 11 Ganesh Idol changes every year. 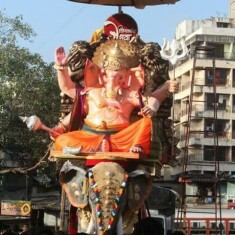 In recent years “Mumbaicha Maharaja” has been among the more creative Ganesh Murtis in Mumbai. 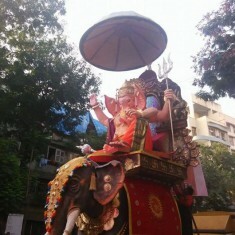 “Mumbai Cha Maharaja” is managed by “Mumbai Cha Maharaja Sarvajanik GaneshOtsav Mandal”, which started in 1962. The Khetwadi Lane (Galli) 12 Ganpati is popularly known as “Khetwadicha Ganraj”. The Khetwadi Lane 12 Ganesh Idol is tall and elegant. 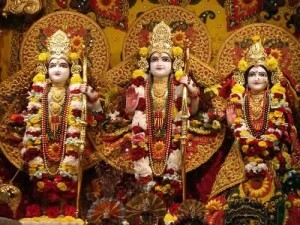 The Mandap/Pandal of the “Khetwadicha Ganraj” is beautifully decorated. An imposing Ganpati and a beautiful Mandal make the Khetwadi Gali 12 Ganesh one of the best in Mumbai. The Mandap is inspired by Moti Mahal in Bhopal. For the last 7 years, “Khetwadi Cha Ganraj” has been winning awards for the best Ganesh Mandal and Idol. The 2015 Khetwadi Cha Ganraj (Lane 12) Ganesh Idol is 14 feet tall and is made by the famous Ganesh Murti maker, Raju Shinde. “Khetwadicha Ganraj” is managed by Khetwadi 12th Lane Sarvajanik Ganesh Utsav Mandal, which started in 1959. Khetwadi Lane 8 has one of the most impressive Ganpatis in Mumbai in 2015. 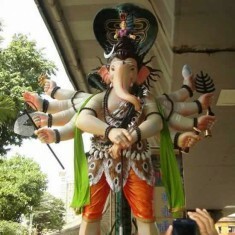 It is a tall, white, aggressive looking Ganesh idol. The Khetwadi Gali 8 Mandal has cleverly used lights and set design to create an eerie atmosphere. One gets the impression that one is in a snow cave in the Himalayas. 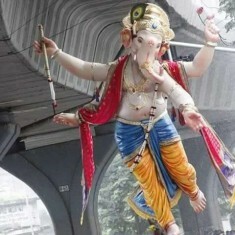 It is one of the most unusual Mumbai Ganesh Mandal in 2015. The 2015 Khetwadi Lane 8 Ganesh Idol is made by murtikar (sculptor) Shankar. For Ganesha devotees, Khetwadi is a must visit area during Ganesh Chaturthi because it has Mumbai’s largest collection of tall and amazing Sarvajanik Ganesh Mandals on a single half kilometer stretch. The 2015 Khetwadi Galli 8 Ganesh is a must-visit Mandal. 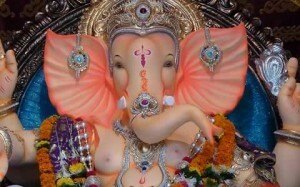 The Lalbaug Ganesh Galli Ganpati idol is known as “Mumbaicha Raja”. 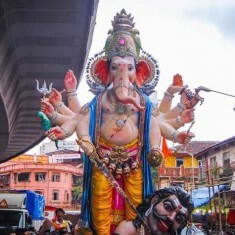 This tall and majestic Ganpati is one of the most famous idols in Mumbai. “Mumbaicha Raja” is placed in a wonderful Mandal which is inspired by Gujrat’s Bajrangbali Temple. Given the drought situation in Maharashtra’s Marathwada and Vidarbha region, the “Mumbai Cha Raja” Mandal has decided to give all donations received in 2015 to “NAAM Foundation”, which is run by Nana Patekar and Makrand Anasapure. 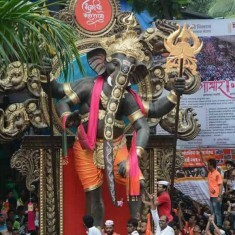 Started at Ganesh Gali (Lalbagh), in 1928, “Lalbaug Sarvajanik Utsav Mandal” manages the “Mumbaicha Raja” Ganesha. 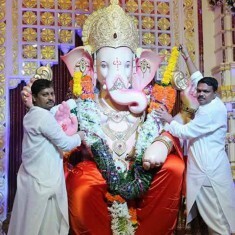 “Andheri Cha Raja”, which is also known as “Navasala Pavnara Ganpati”, is the most popular Ganpati in the Western Suburb of Mumbai. Reasons “Andhericha Raja” is famous is because it is considered a wish fulfilling Ganpati, the Ganesh Mandap/Mandal is beautiful and many film stars from the Hindi film industry frequent this Mandal. The 2015 “Andhericha Raja” Pandal is a replica of the amazing Ambaji Mata Temple in Gujarat. TOI awarded the “Andhericha Raja” the third best Ganpati Mandal in Mumbai in 2015. 2015 is the Golden jubilee of “Andheri Cha Raja” The design of the 8.5 ft “Andhericha Raja” has remained unchanged for the last 50 years. 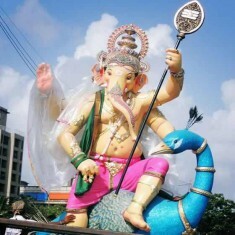 “Andhericha Raja” is the only major Ganpati that is immersed 5 days after the Visarjan of the other big Mumbai Ganpatis. So instead of on “Anant Chaturdashi”, Andhericha Raja’s Visarjan takes place on “Sankashti Chaturthi”. A small Ganpati at the “Andhericha Raja” Pandal is immersed on “Anant Chaturdashi”. Khetwadi Khambatta Lane Ganesh is among the best Ganpati Murtis in Mumbai in 2015. 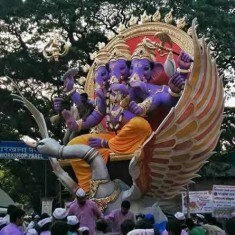 The 2015 Khetwadi Khambata Lane Ganpati is a tall, purple, 3-headed Ganesh sitting on a large swan. “Khetwadi Cha Raja” Ganesh Idol is in the form of Brahma, Vishnu and Mahesh. The total structure is 25 feet, making it among the tallest Ganpati in Mumbai in 2015. Kunal Patil made this wonderful Ganesh idol. 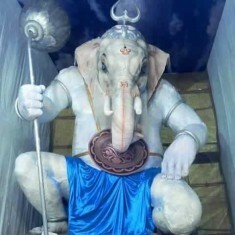 The Khambata Galli Ganesh is known as “Khetwadicha Raja” and is managed by “Khambata Road Sarvajanik Ganeshotsav Mandal”. This Mandal lays emphasis on harmony and unity between all communities and religions. 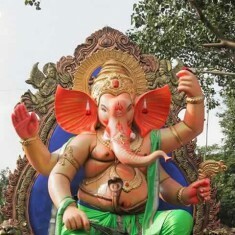 The Nare Park Ganpati is called “Parelcha Raja”. 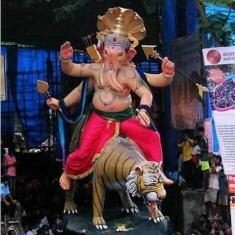 Year after year “Parelcha Raja” (Nare Park) is among the top Ganesh idols in Mumbai. 2015 is no exception. 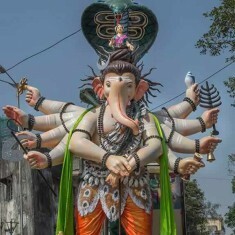 The tall, 10-hand, “Parelcha Raja” Ganesh is standing with his foot on the head of the demon “Sindura”. 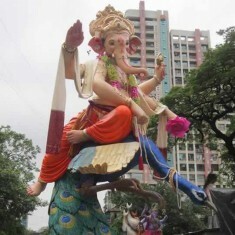 Since 1947 “Parel Vibhag Sarvajanik Ganeshutsav Mandal” have been organizing “Parel Cha Raja” (Nare Park) Ganesh. “Grant Road Market Cha Raja” is among the best Ganpati idols in Mumbai in 2015. Designed by famous Ganpati sculptor, Vijay Khatu, the 2015 “Grant Road Marketcha Raja” is a ten-hand, tall Ganesh modeled on Lord Shiva. The idol has a snake over its head and Ganga in his hair. “Grant Road Market Cha Raja” is located at the Bhaji Gali outside Grant Road station. 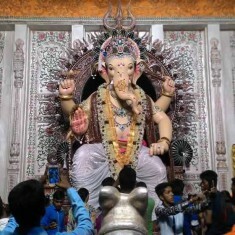 “Lalbaugcha Raja” is Mumbai’s Most Popular Ganpati during Ganesh Chaturthi. 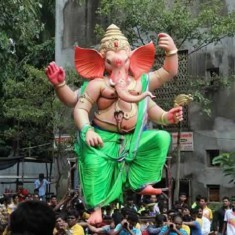 During Ganesh festival, more devotees visit “Lalbaghcha Raja” than any other Ganesha in Mumbai city. 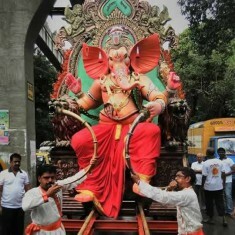 One reason that “Lalbaugcha Raja” is so famous is because it is considered a wish fulfilling Ganesh (“NavsachaGanpati”). 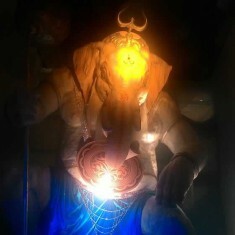 The tall “Lalbaghcha Raja” Ganesh idol has been made by the Kambli family since 1935. The design of the Ganpati Murti remains more or less the same every, except for the ornaments, clothes and accessories. The wonderful 2015 Sheesh Mahal (Palace of mirrors) pandal for “Lalbaghcha Raja” was designed by famous film art director, Nitin Desai. This set was later used for the Salman Khan film “Prem Ratan Dhan Payo”. 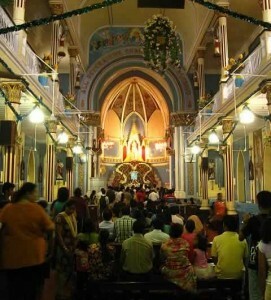 “Lalbaugcha Raja” Ganeshutsav started in 1934 and is managed by “Lalbaugcha Raja Sarvajanik Ganesh Mandal”. 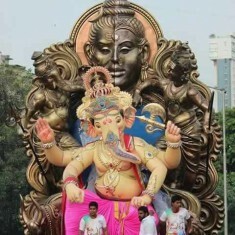 “Vile Parle Cha Peshwa” is the most environment friendly large Ganesh idol in Mumbai in 2015. Stating tall at 22 feet, the “Vile Parlecha Peshwa” is made from recycled bamboos and tissue papers. Weighing 150 Kgs, the idol cost only Rs 18,000. The Ganesha idol is made by Digambar Manikar and his son Rajesh Manikar. Since 2008, “Bal Gopal Mitra Mandal”, the Mandal that manages “Vile Parlecha Peshwa”, has been installing an eco-friendly Ganpati Murti. 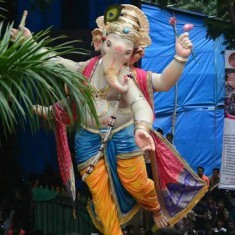 In 2006, 19 year old Derek Jadhav presented a 3 feet eco-friendly Ganpati, made of tissue paper to the Mandal. He suggested that the Peshwa could also be an eco-friendly Ganpati. The Mandal rejected his idea. Tragically Derek passed away in a train accident; that’s when the “Vile Parlecha Peshwa” Mandal decided to follow Derek’s suggestion and ever since they have been installing an environment friendly Ganpati. “Chinchpokli Cha Chintamani” is one of Mumbai’s most famous and oldest Ganpatis. “Chinchpokli Sarvajanik Utsav Mandal” has been organizing the “Chinchpokli Cha Chintamani” Ganesha since 1920. 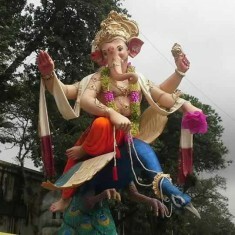 The 2015 “Chinchpokli Cha Chintamani” Ganesh Idol is made by Vijay Khatu. “Chintamani” is sitting on his throne playing the sitar. Located near Chinchpokli Railway Station, the 2015 “Chinchpokli Cha Chintamani” is housed in a beautiful “Kalpanik Mahal”, which is inspired by royal palaces. “Raja Tejukaya” is one of the three most famous Ganpatis from Lalbagh in Central Mumbai. The other two Ganeshas are “Lalbaugcha Raja” and “Mumbaicha Raja” (Ganesh Gali). The impressive 2015 “Raja Tejukaya” Ganesh Idol is made by Rajan Zad. 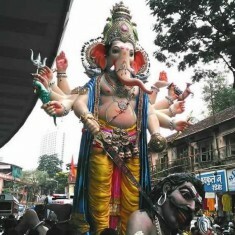 The 18 feet tall “Raja Tejukaya” Ganesh is dressed in battle armor and is standing next to an elephant. “Tejukaya Sarvajanik Ganeshostov Trust” is the Mandal that manages “Raja Tejukaya”. 2015 is the 50th years of “Currey Road Cha Kaivari” Ganpati. 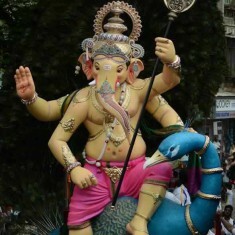 The 2015 “Currey Roadcha Kaivari” Ganesh Murti is a royal, aggressive looking idol. “Kaivari” means protector and avenger and the look of the “Currey Road Cha Kaivari” Ganpati lives up to his name. “Dharavi Cha Sukhakarta” is one of the most creative Ganesh Murtis in Mumbai in 2015. 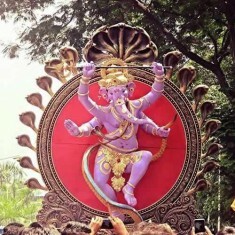 The 2015 “Dharavi Cha Sukhakarta” is a purple coloured Ganpati in a dancing pose. He is standing against a throne of snakes, which is held up by a giant snake. This innovative Ganpati Morti is made by Ganesh sculptor Krunal Patil. 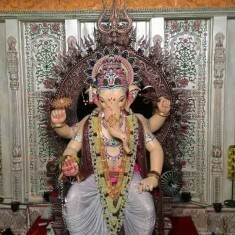 “Chandanwadi Cha Raja” Ganesh Idol is located at Yeshwant Chawl, Chandanwadi, near Marine Lines Railway station. 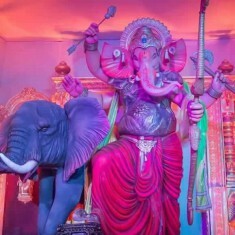 2015 “Chandanwadi Cha Raja” Ganpati Idol is made by famous Ganesh Murtikar (sculptor) Vijay Khatu. 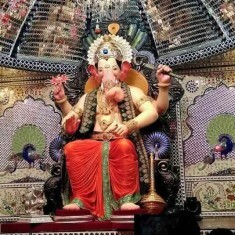 Managed by “Akhil Chandanwadi Sarvajanik Ganeshustav Mandal” “Chandanwadi Cha Raja” is one the biggest Ganesh Mandals in South Mumbai. 2015 is the 50th year celebration for “Malwanicha Raja” Ganpati. Located at BEST Colony in Malad (East), “Malwani Cha Raja” is among the more popular Ganesh idols in North Mumbai. The impressive 2015 “Malvanicha Raja” Ganesh Idol is made by Rajan Zad (Jhad). 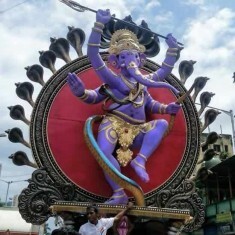 “Malwanicha Raja Sarvajanik Ganeshotsav Mandal” are the organizers of “Malwanicha Raja”. The “Mira Bhayander Cha Raja” Ganesh Idol is among the nicer Ganpatis during the 2015 Mumbai Ganesh Chaturthi Festival. The 2015 “Mira-Bhayander Cha Raja” is a tall Ganpati Idol sitting on a peacock. 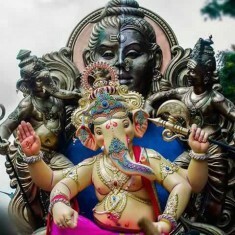 The Ganesh isin the form of “Mayuresvara” or “Vikata”. 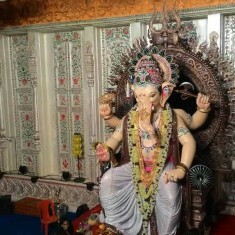 “Mira-Bhayandercha Raja” Ganpati is managed by Siddhivinayak Seva Mandal, Bhayander (East). It is among the top Mandals in the northern suburbs of Mumbai. “Kamatipura Cha Chintamani” is among Mumbai’s famous Ganpatis. 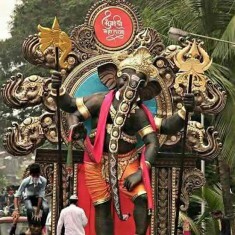 The 2015 “Kamatipura Cha Chintamani” Ganesh Idol is designed by Vijay Khatu. 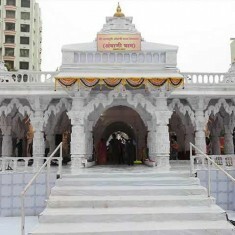 “Kamatipura Cha Chintamani” is managed by “Kamathipura Sarvajanik Ganesh Utsav Mandal” and is located at Kamatipura Lane 14. The 2015 Khetwadi Gali 7 Ganesh is seated on a beautiful peacock. The Khetwadi Lane 7 Ganesh Idol is among the better idols in Khetwadi in 2015. For the last few years, Khetwadi Lane 7 has been producing very creative Ganesh Idols. 2015 “Tardeo Cha Raja” Ganesh is sitting on a throne that is overlooked by his father, Lord Shiva. 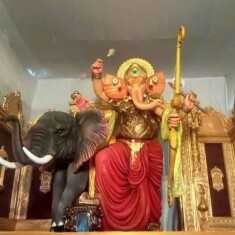 2015 “Tardeo Cha Raja” Ganpati Murti is made by Kunal Patil. 17 September, 2015 (Thursday): Start of Ganesh Chaturthi (Ganesh Festival) when Ganesh Idols are installed at homes and in Ganesh pandals. Ganesh Utsav starts on Shukla Chaturthi in the Hindu month of “Bhaadrapada”. 18 September, 2015 (Friday): Ganesh Visarjan of Ganapati statues after 1 day. Many Ganpati idols that are brought to residential homes are immersed on this day. 95% of Ganesh murtis in Mumbai are installed in residential homes. 21 September, 2015 (Monday): Gauri Visarjan when idols of Goddess Gauri (Parvati, mother of Ganesha) are immersed. The richest Ganesh Idol in the world, GSB Seva Mandal’s Ganpati, is immersed on the 5th day of Ganesh Chaturti. 27 September, 2015 (Sunday): Final date of Ganesh Visarjan (Immersion), which falls on “Anant Chaturdashi” in the Hindu month of “Bhaadrapada”. Most of Mumbai’s biggest and most famous Ganesh Idols are immersed in the sea on this day. PLEASE NOTE: Mumbai will have very high tide of around 4.6 meters on 27 September, 2015, which is the final day for Ganesh Visarjan. Be very careful while entering the sea for Ganpati Visarjan. 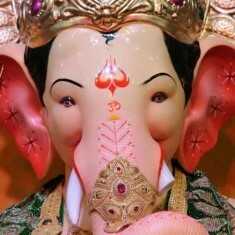 This is a list of the best and most famous Ganpati idols and Ganesh Mandals in Mumbai. These famous Mumbai Ganesh Idols can be located on the map below. GSB Seva Mandal’s Ganesh Murti located at G.S.B. Sports Club Ground, King Circle. 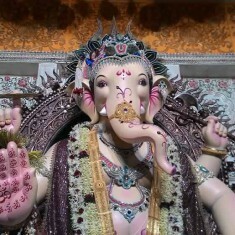 This is Mumbai’s and the world’s richest Ganesh Mandal. Listed below are some of the most famous Ganesh Murti sculptors and designers from Mumbai. Also listed are 2015 Ganesh Idols Made by these famous Ganpati creators. Digambar Manikar and Rajesh Manikar: In 2015 they made the eco-friendly “Vile Parlecha Peshwa” Ganpati Idol. They specialize in environment friendly Ganesh Idols. 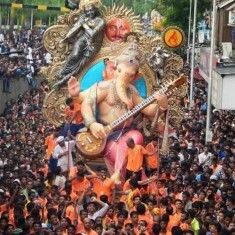 Nowhere in the world is Ganesh Festival (“Ganeshutsav”) celebrated with the passion and on the scale as it is in Mumbai. It is estimated that around 200,000 Ganpati Idols are installed and worshipped during the 11 day Ganesha Festival. Around 955 of Ganesh Murtis are bought by individuals for their homes. The balance 5% Ganesh Idols are large statues that are installed in community “Pandals”. 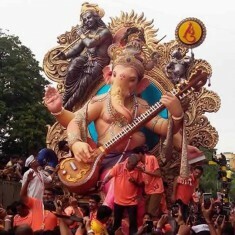 Ganesh Chaturthi celebrations are unique in Mumbai because it a community event, which is why it is called “Sarvajanik Ganeshutsav”. Around 10,500 Sarvajanik Ganesh Mandals are registered in Mumbai and its suburbs. These Sarvajanik Mandals are given permission to install Ganesh Murtis in Pandals on public roads and open spaces. 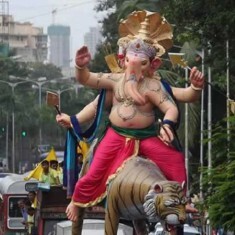 This form of special community Ganesh Festival celebrations was first introduced in Mumbai in 1893 by the legendary freedom fighter Lokmanya Tilak. He used Ganeshotsav to spread the message of freedom from the British and to unite Indians. Please click on the below links for route and map of the main Ganpati Visarjan (Immersion) locations in Mumbai.